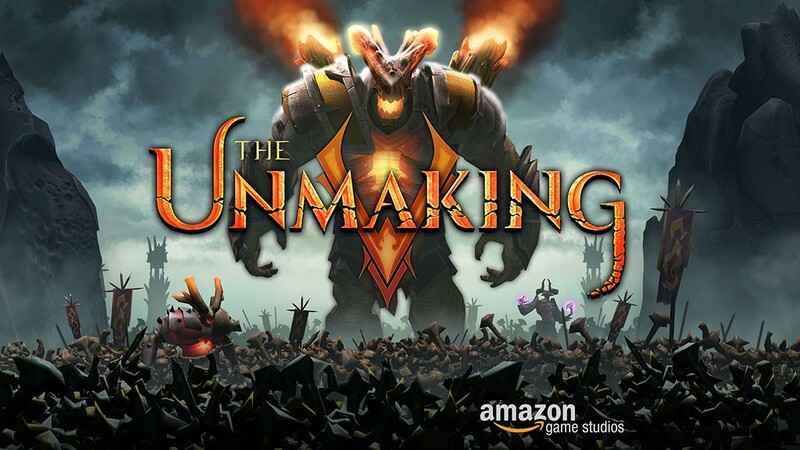 The Unmaking is an action game where you defend a castle against “waves” of massive enemy hordes. 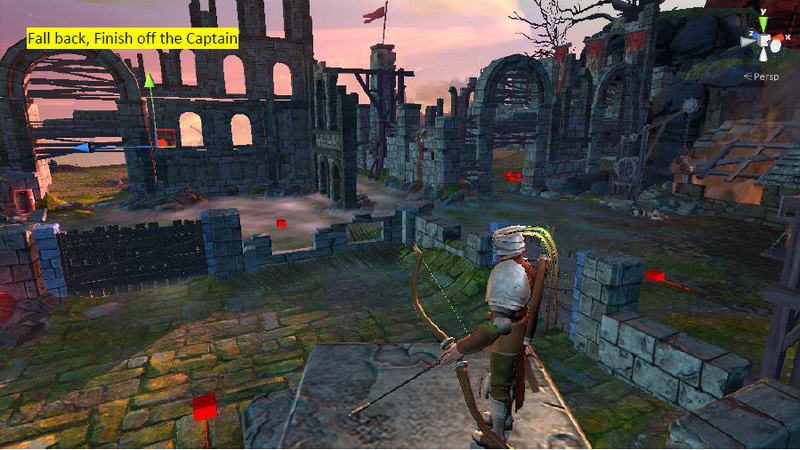 With touch-based controls, you command various mounted weapons, dragging your finger to aim your shots out from the castle wall.The game utilizes Amazon’s AppStream service to render PC quality graphics in the cloud and stream to a tablet. My primary responsibilities were as the team’s level designer, building all of the layouts, scripting, and configuring play. 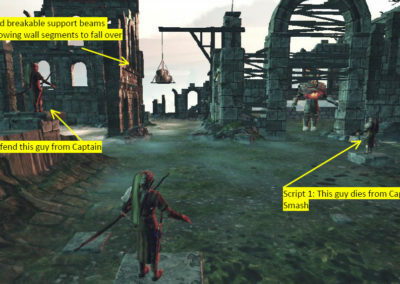 I also did early enemy prototyping and collaborated with UX on controls and player feedback systems. 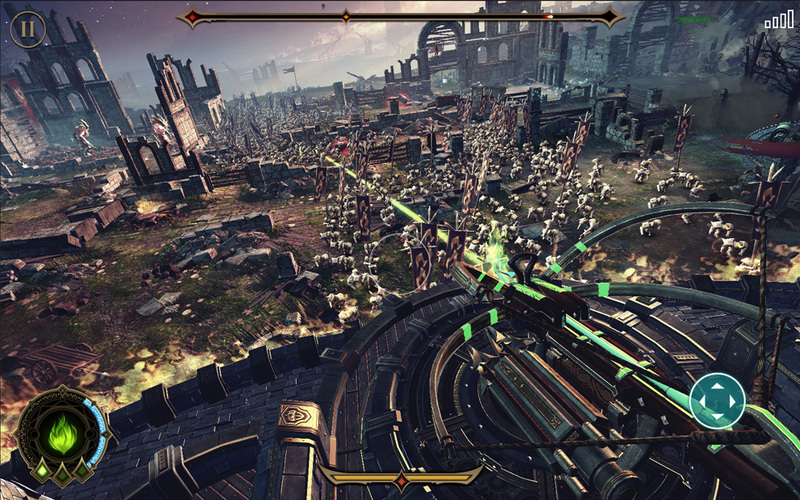 Cloud rendered gameplay created limitation on controls and gameplay feedback. The technology performs best when camera remains fixed. 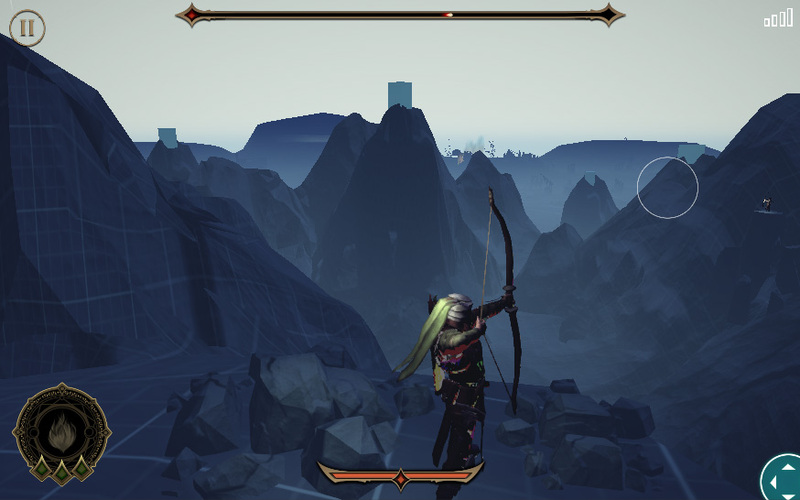 Additionally, the control input is done locally and sent to the server so control feedback (like projected UI about where a shot might land) proved difficult. An aggressive schedule didn’t allow for very much iteration or bake time. Designing for a stationary player can be quite challenging. 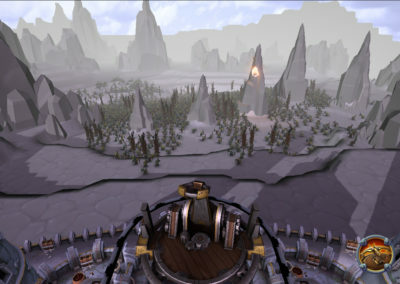 It was helpful to think of the experience as if the level was coming toward you and apply some of the same FPS concepts. How do we prioritize threats and make meaningful choices? What kinds of expositions can we leverage to bring enemies into play? What types of cues can we use to grab the player’s attention or lead their eye? 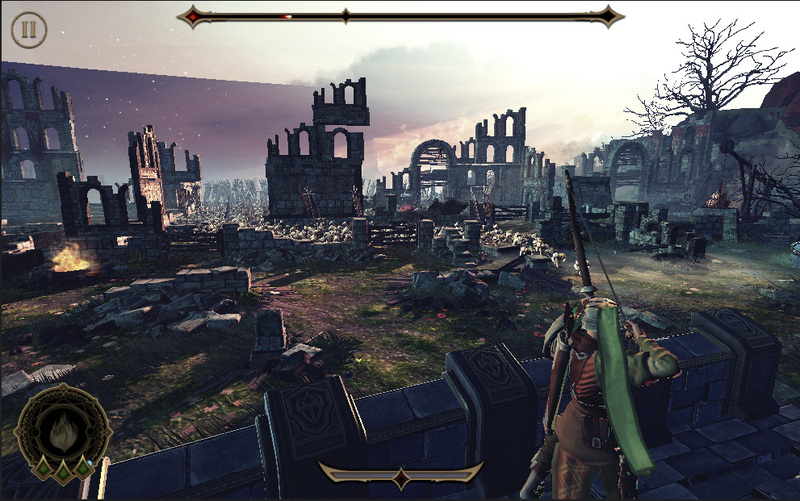 Destructible environment to crush and reroute enemies. Explosive barrels tossed into scene to help the player. Switchback provides lateral movement for improved targeting. 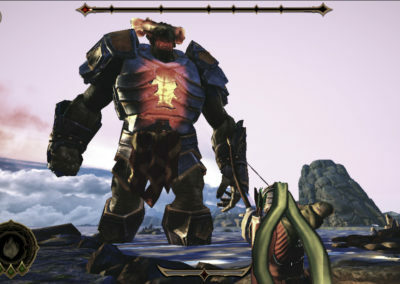 Large enemies behind the switchback are vulnerable to head shots. 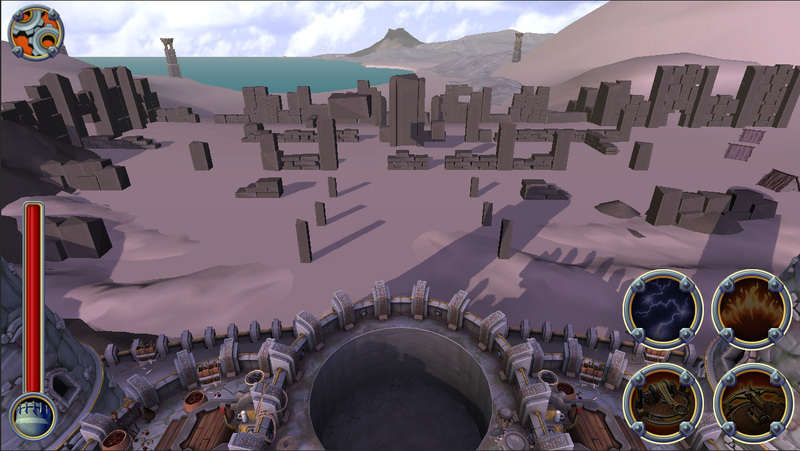 A bowl-like layout supports a large, physics based boulder weapon. 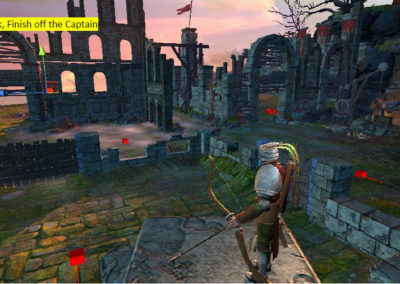 Play the sides of the level while leaving flow-control wall structures intact. 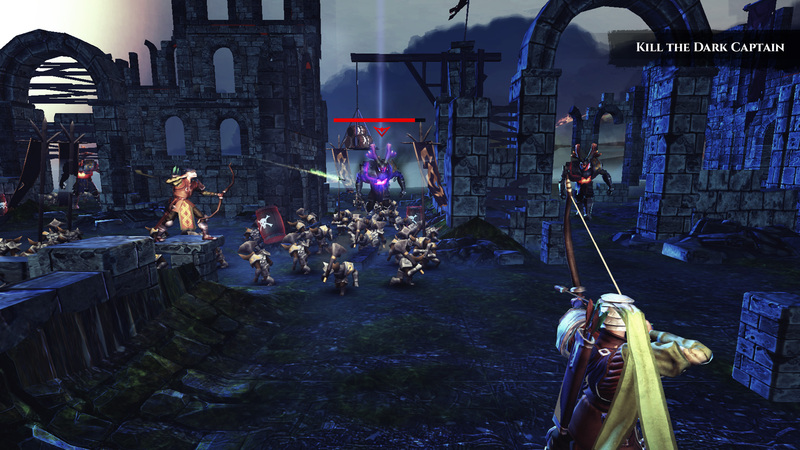 The left and right archways allow for surprise attacks. 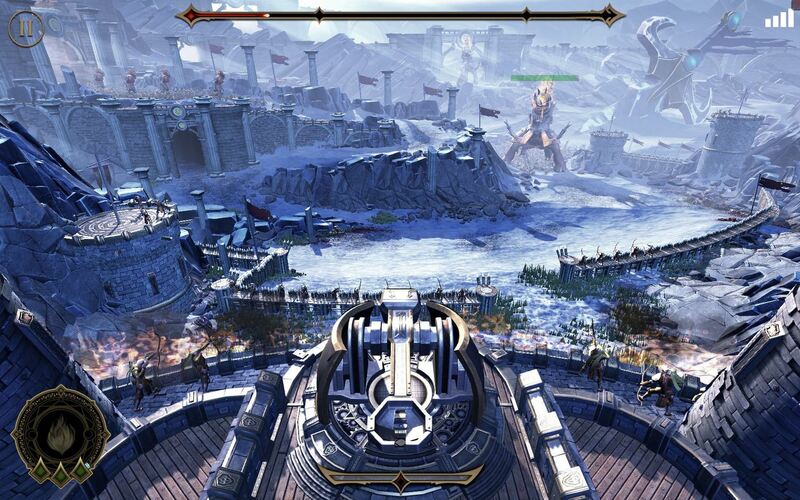 Enemies in the distant center can quickly become a serious threat. 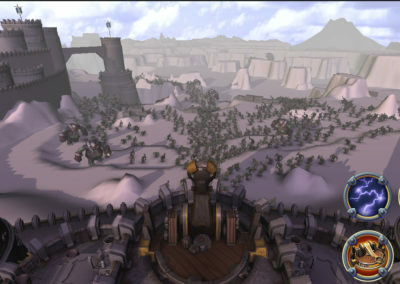 An intense battle arena with a wide open center and numerous hidden openings along the left and right walls. Four bridges over a massive ravine. 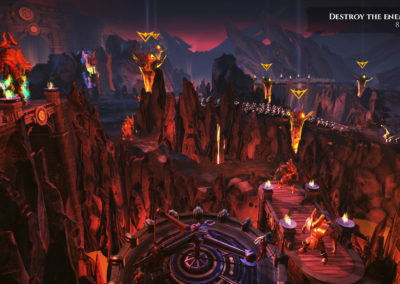 Two bridges are destructible while the ravine allow for surprise attacks by flying enemies. 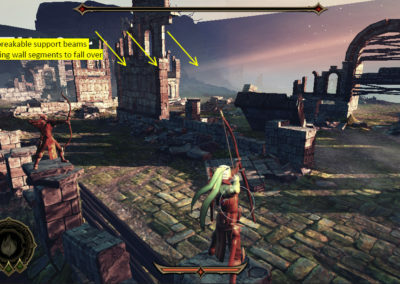 Enemy routes change over time, creating a wide variety of attack angles. 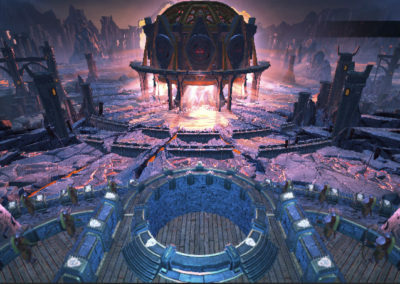 A central puzzle structure must be destroyed to end the game. 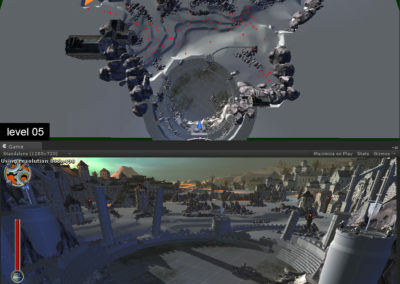 While day and night cycles and weather FX kept the levels visually interesting, heavily scripted scenarios were required to keep play interesting and exciting over time. 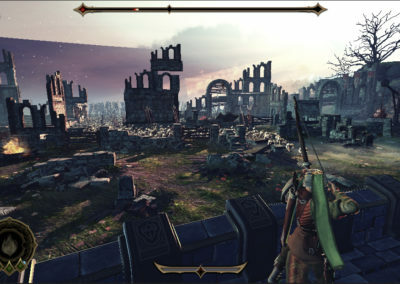 Some techniques included: dynamically changing sight lines, destructible environments that crush enemies and alter the flow of play, shooting exploding objects launched onto the battlefield, and balancing periods of uneasy silence with ambushes and coordinated enemy attacks. 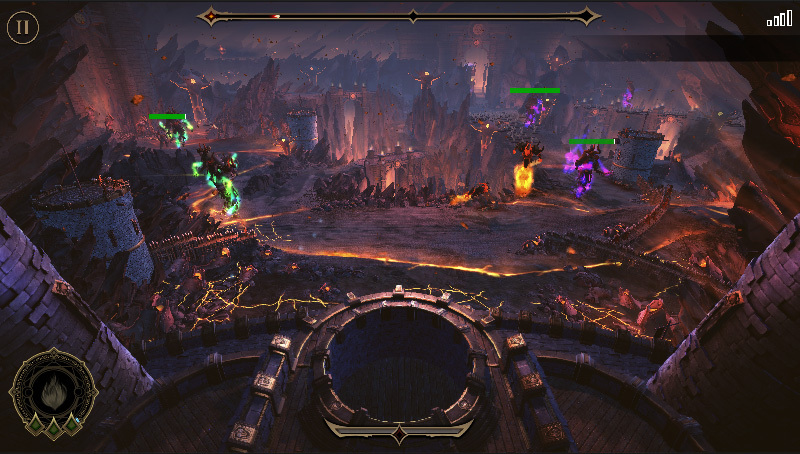 Combat was kept fresh by using clever combinations of enemies and leveraging each level’s unique design to full effect. 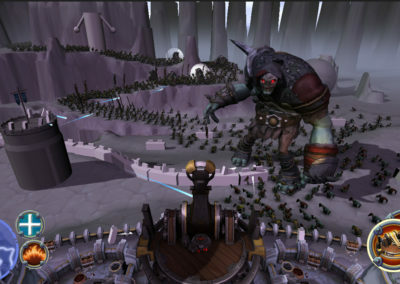 As is common with designing the “first level” of any game, this level went through more design iterations than any other level in the game. 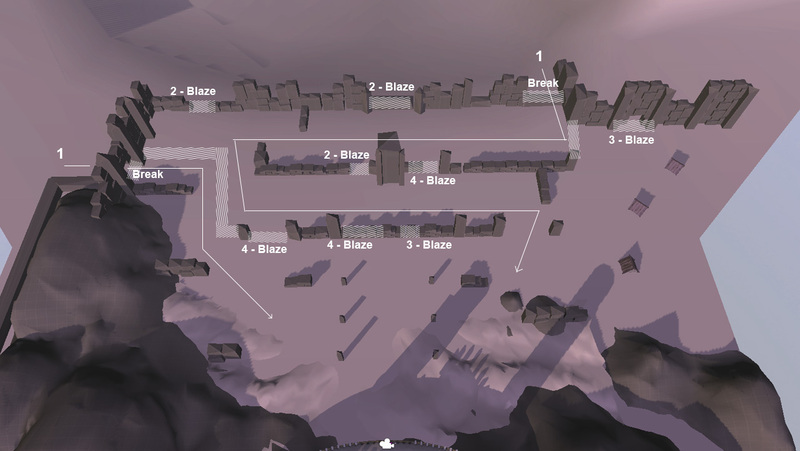 Below is a brief overview of how the first level evolved over time. 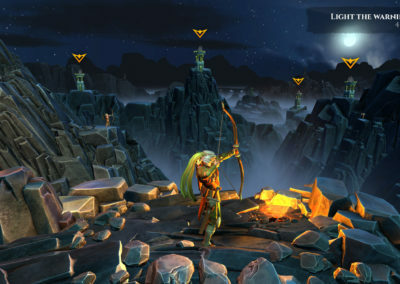 As the first level, its primary function is to introduce the game’s mechanics in an exciting and engaging way, without overwhelming or frustrating the player. 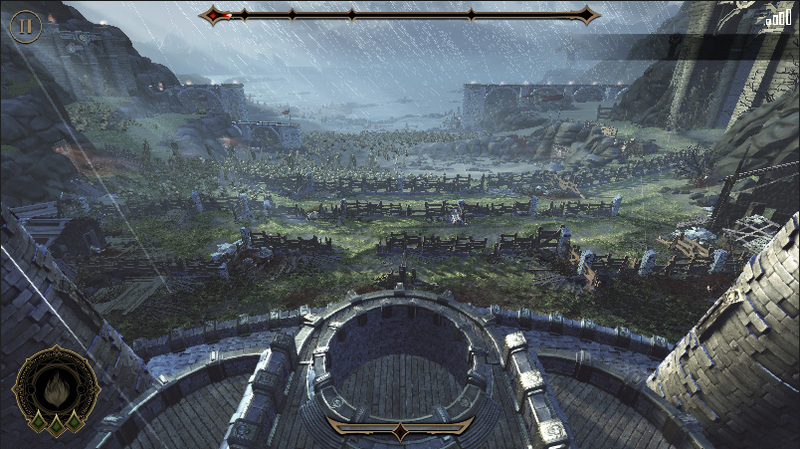 The layout presented above was designed to give the player plenty of time to see enemies coming before they were actually a threat. 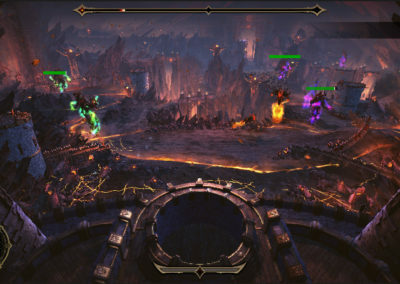 Playtesting revealed that the level was too overwhelming as large numbers of enemies poured into battle from multiple locations. Even though enemies were of a weaker type, the perceived threat was significant. Combined with learning the controls, this proved frustrating for most play testers. Playtesting showed significant improvement in cognitive load after flow control adjustments made in the previous pass. 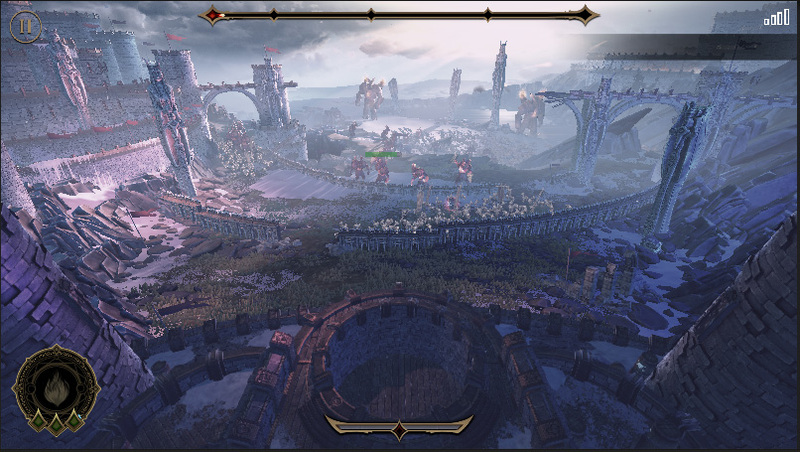 Now, we were in a position to start increasing the difficulty over time, and bring more interactive elements into play. The following changes would occur over several passes, each with more testing and adjusting. 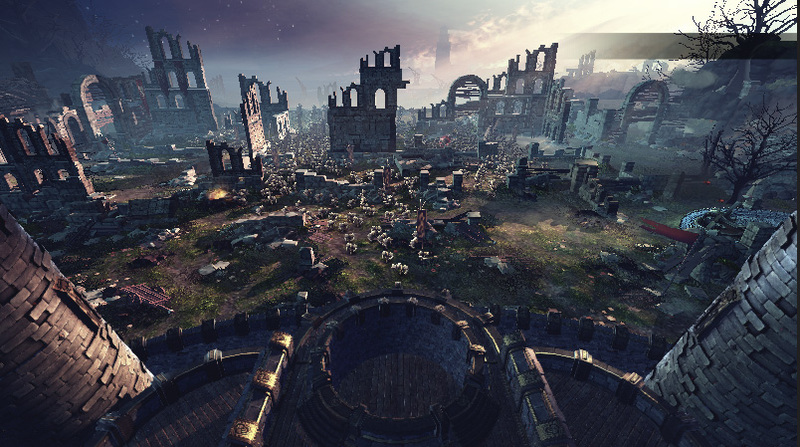 Once the difficulty progression and dynamic environmental elements passed through testing. 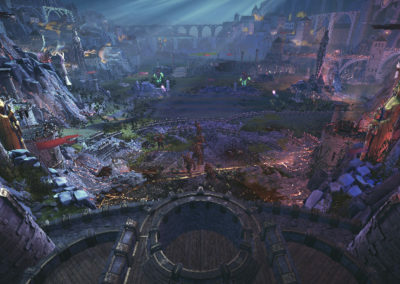 We were ready to hand the level to the art team. 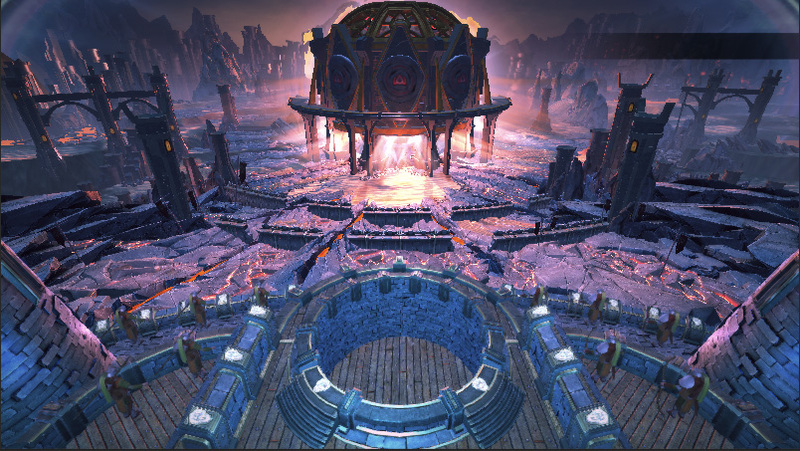 Artists have been involved throughout the entire design process and we all understand how the level is intended to play. This was an important point in case the geometry was accidentally moved during development. 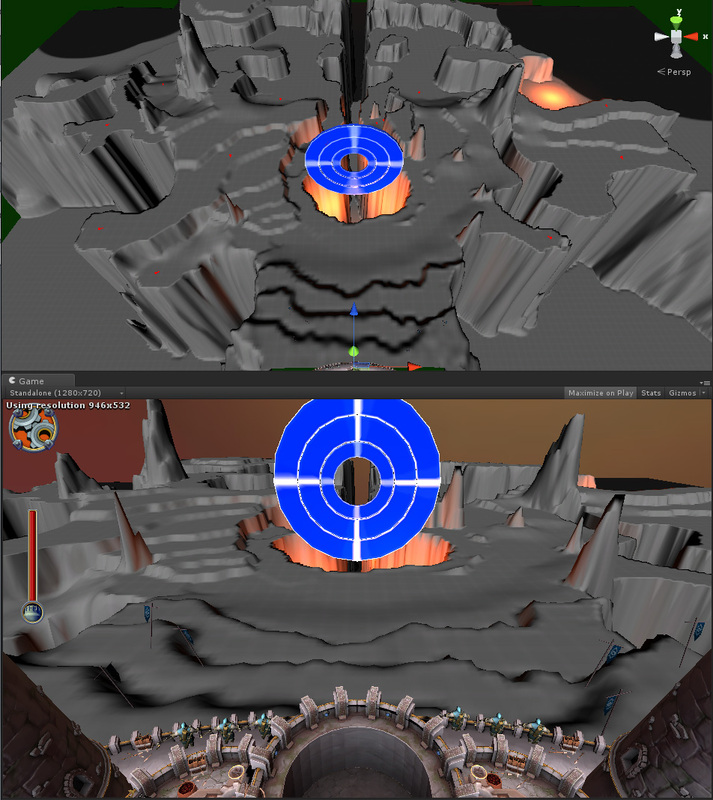 Following an art pass, the level was ready for decorative scripted events, such as large enemy projectiles smashing down your outer walls to reveal the on coming enemies. 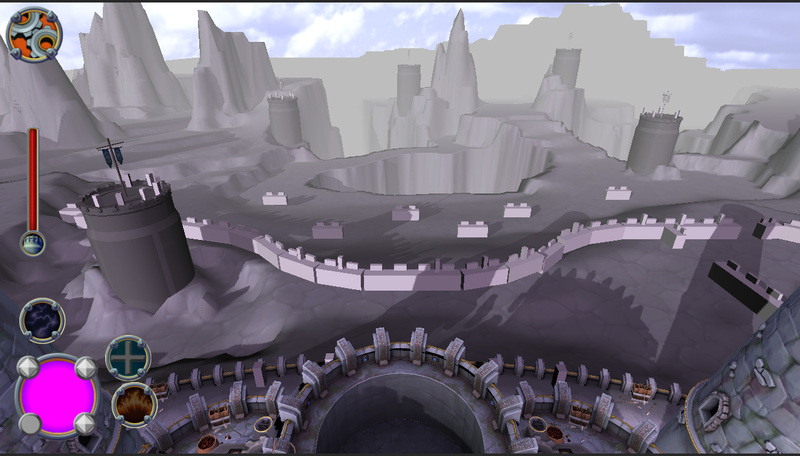 (these were non-blocking assets) This process continued until the art was finalized and the level was retested. After the release of the 1.0 product, UX Designer, Colin Riley, and I were tasked with developing a design, plan, and schedule for the next release. Our primary goals revolved around increasing PENS (Player Experience of Need Satisfaction) scores, specifically autonomy and competence, while reusing and extending as much of the current assets as possible. Additionally, repetition was often one of our weakest points in usability studies. 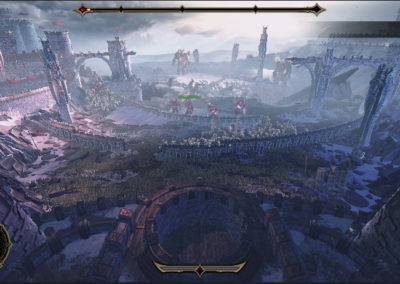 One of the strengths of the product was the quality of both the characters and environment but the restrictions of both the streaming tech and current design limited the view of the battlefield to one angle. 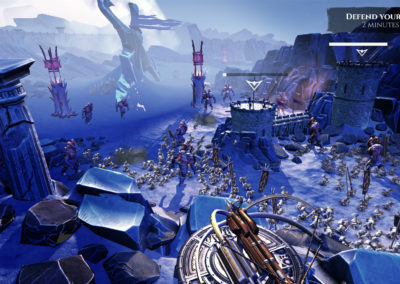 Our plan emphasized a simple and flexible mission system to both move you around the battefield and experience new gameplay dynamics. 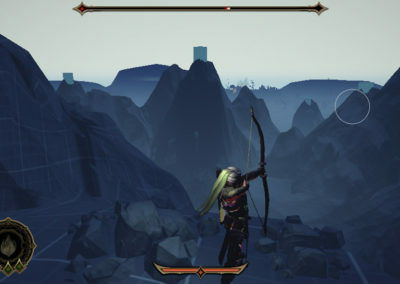 We drafted a straight-forward narrative arc to tie missions together and introduced missions where you play as an archer to simplify the FTUE (First Time User Experience) as well as increase relatedness. As an archer on the ground, this scaled up enemy presents a more serious threat. 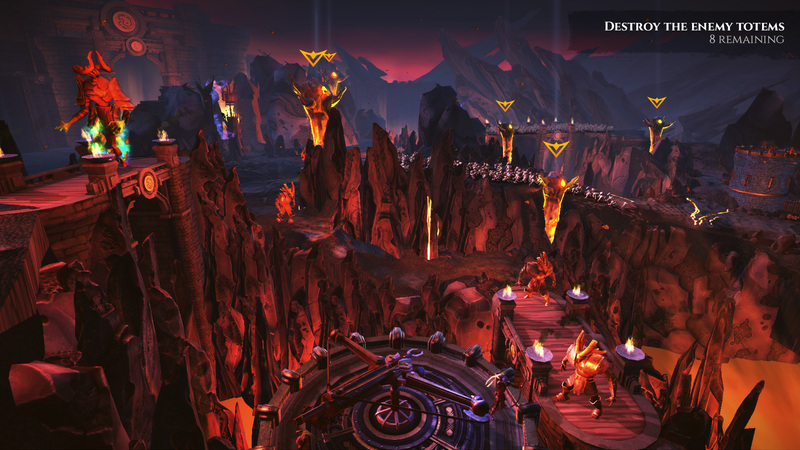 Experience the level design up close, for a greater dramatic impact and more variety in play. 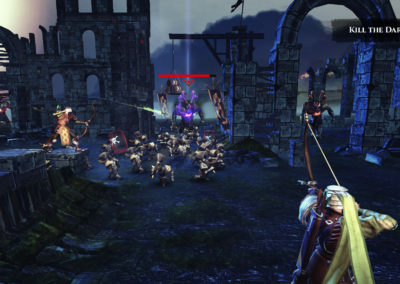 The Pylon level was made to introduce players to their new role as an archer and familiarize them with the new mission. Prototype footage lacks proper camera transitions and is condensed to show multiple concepts in a short time. 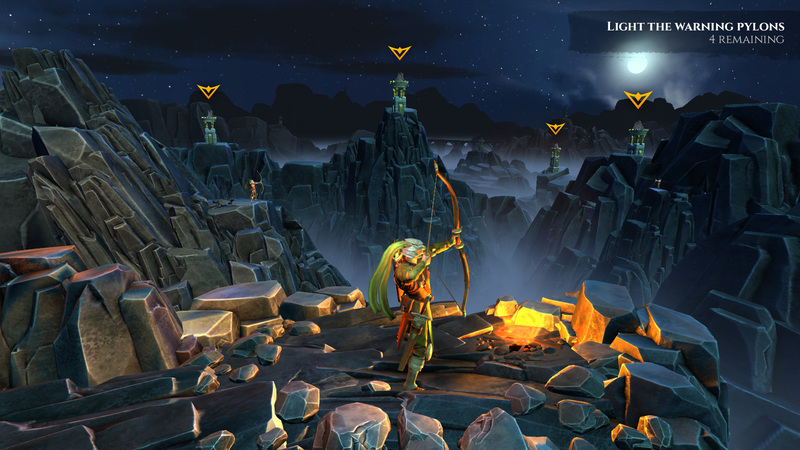 Our design sessions produced a rough play sequence which was used to assemble the first archer mission prototype. Moving forward, we would continue iterating on timing and adding interactions until we felt really good about the overall experience. 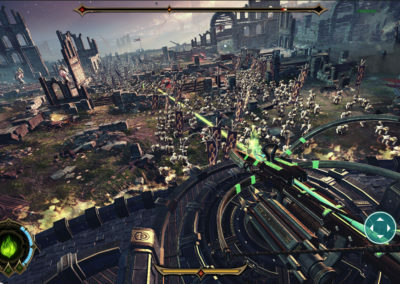 Light the pylons to report a massive horde moving through the pass, toward the town. First scripted encounter with a “Captain”. 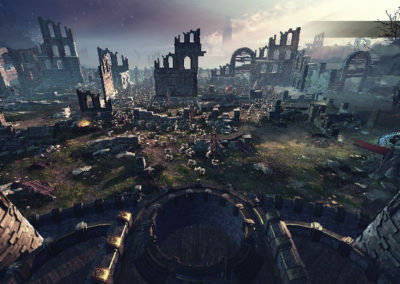 These enemies create paths by smashing things, including people. 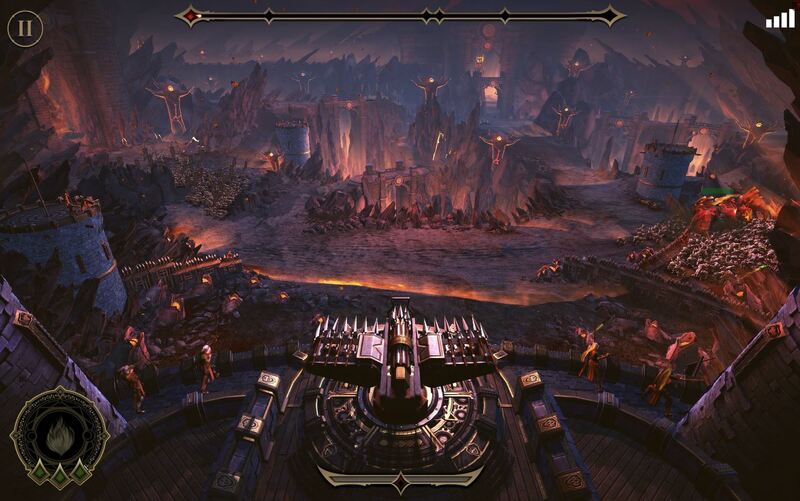 Establish that Captains have many hit points. You’ll have to level up to take them out more quickly. 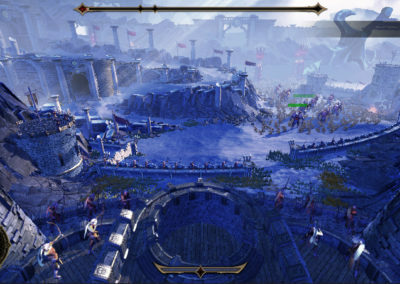 A huge wave overwhelms the battle field and you must fall back to fight from the wall. 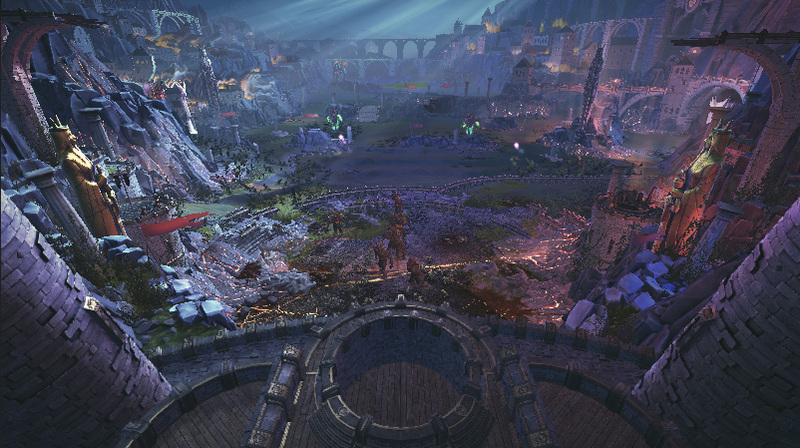 A massive projectile slams into the castle, wiping out your allies. 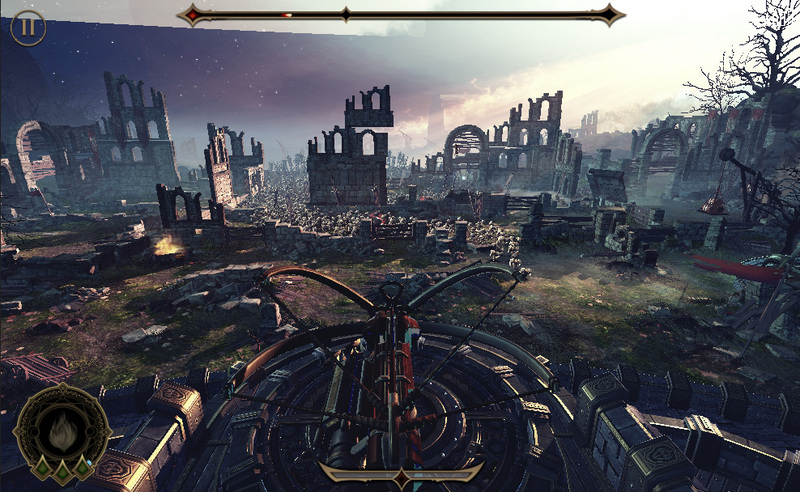 Ears ringing, camera wavering, you take control of the massive weapon and end this battle victoriously. 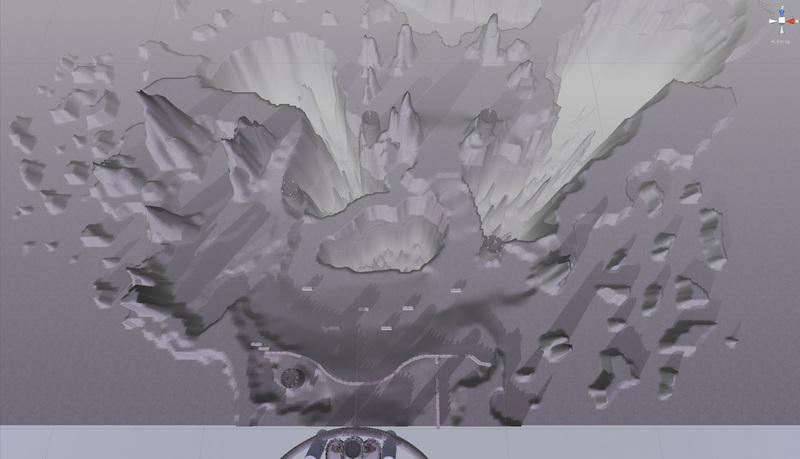 Level Designs tend to evolve over time and some layouts never make it into the game. 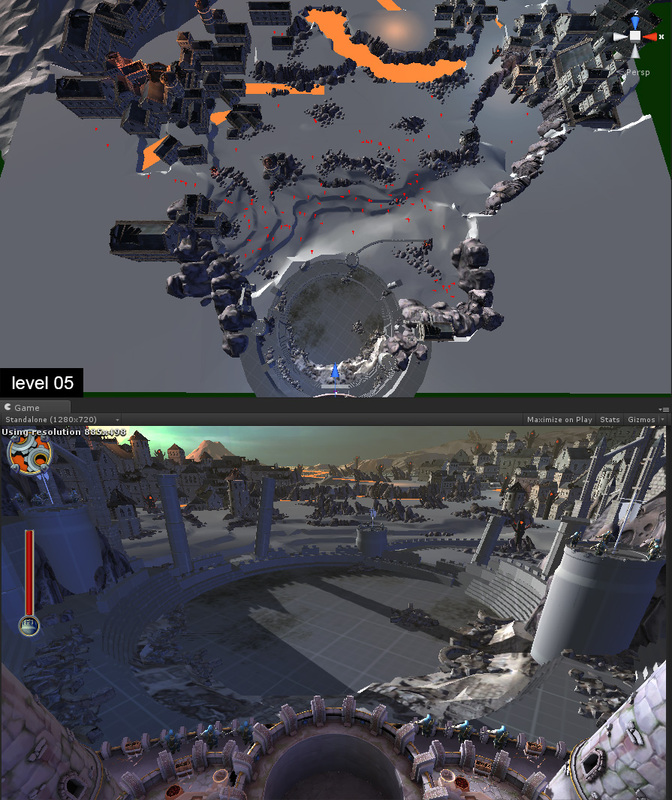 Below are some early grey box versions of levels that went into testing. In some cases, extreme changes were necessary to deliver on the design intent. A dominant center line. 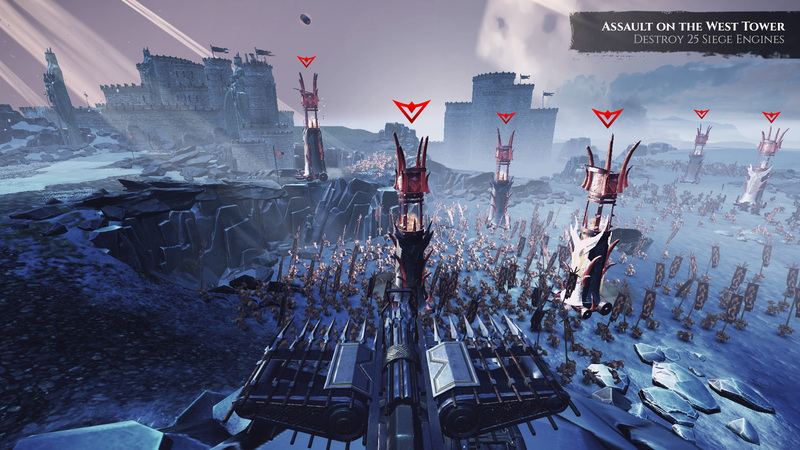 Small enemies filter through he trees while larger enemies topple them like dominoes. Pathing calculations proved troublesome and this level was cut. 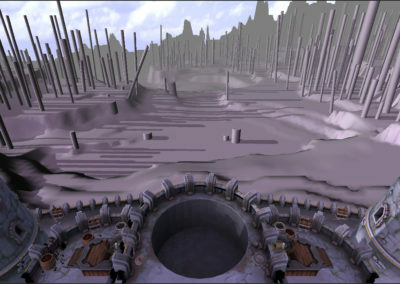 A continuation of the forest, this level maintained its switchback motif and made it into the game after leveling the forest in the background. A large backfield game players time to plan. 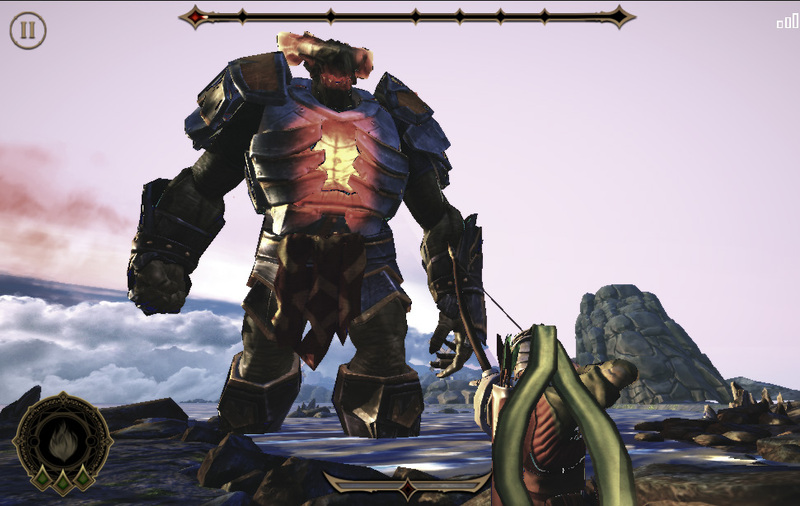 A steep ascent made enemies appear to disappear and pop up right in front of you. 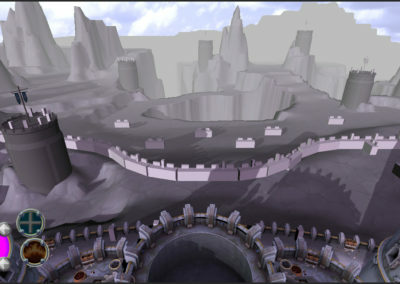 This level is almost unrecognizable but its intent is clearly preserved. 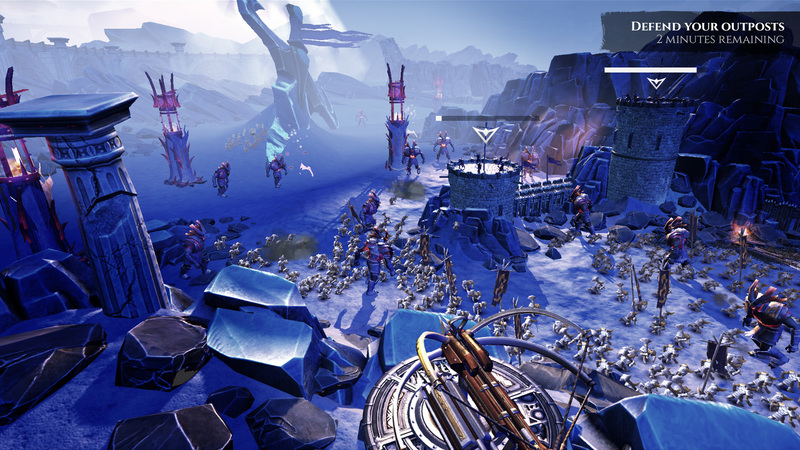 A large area with vertical obstructions provided cover for enemies. 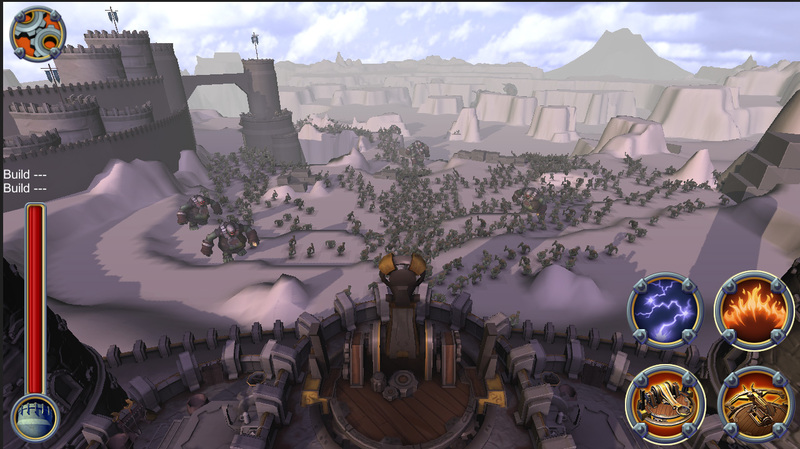 Large center spires were replaced with thematically correct pillars. 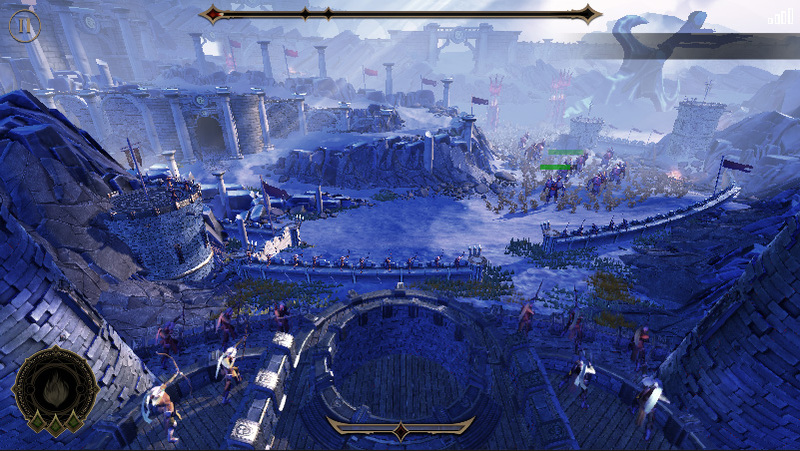 The large central arena was preserved. 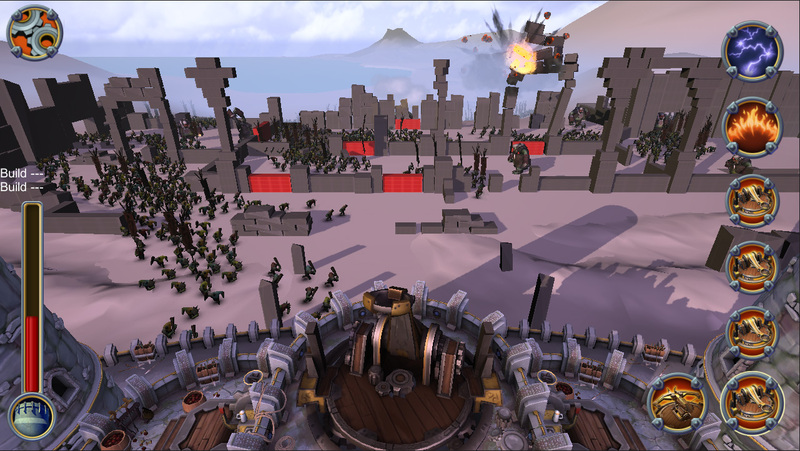 Some of the land bridges were replaced by destructible stone bridges. 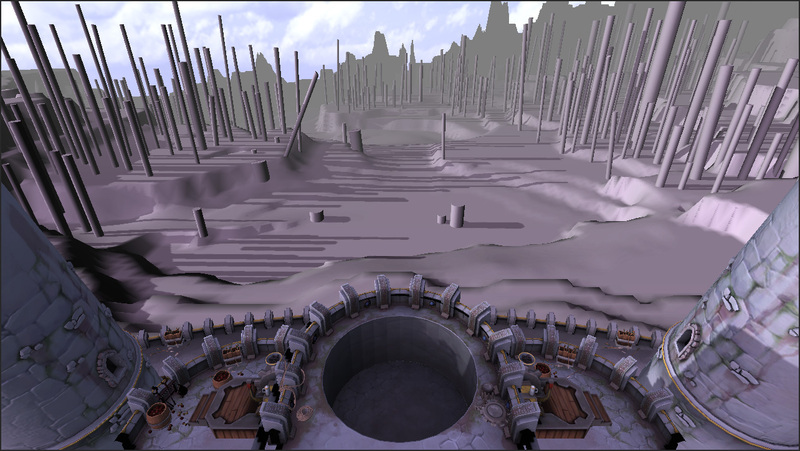 This level was among the lease altered from its grey box. 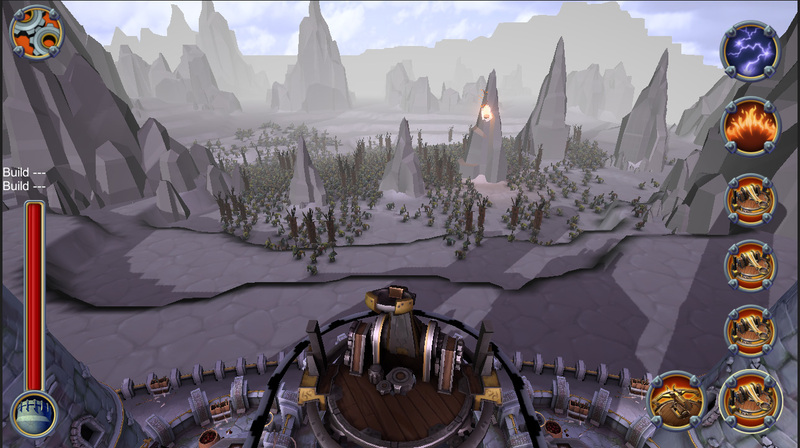 A view of the pathing required to build a variety of combat scenarios. 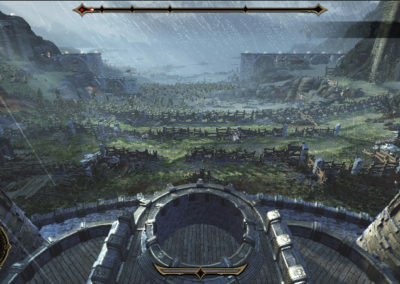 An overhead view was considered for the game, but was cut due to performance issues. 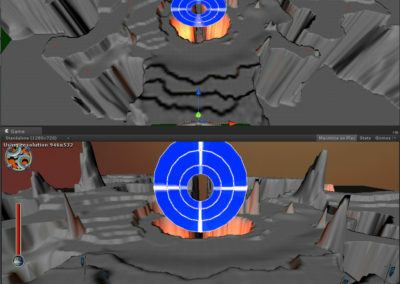 An editor view showing the complexity of the heightmap. 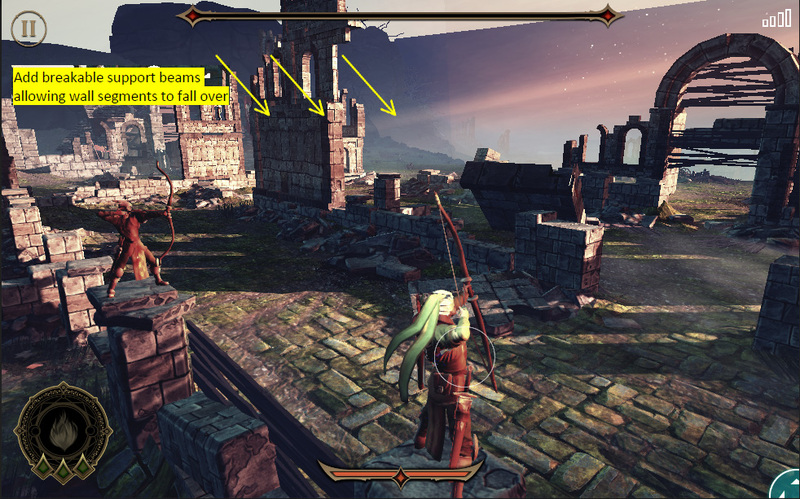 Some paths are obscured by the central puzzle element, giving players intermittent sight lines. 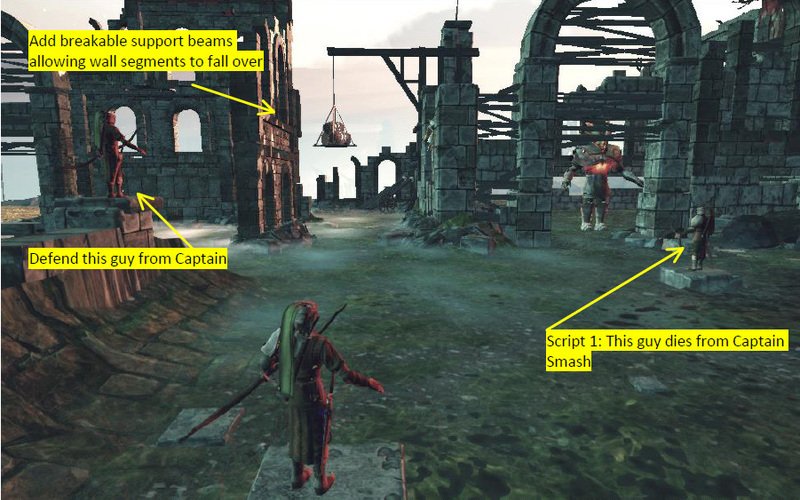 Before I could jump into level design, we needed to have some ideas how combat would work. The design team kicked off the project with 2 major prototypes. I was responsible for generating a number of enemy ideas while another designer worked on weapons. Following a week of prototyping, we would gather feedback and combine the most promising ideas into a playable prototype. 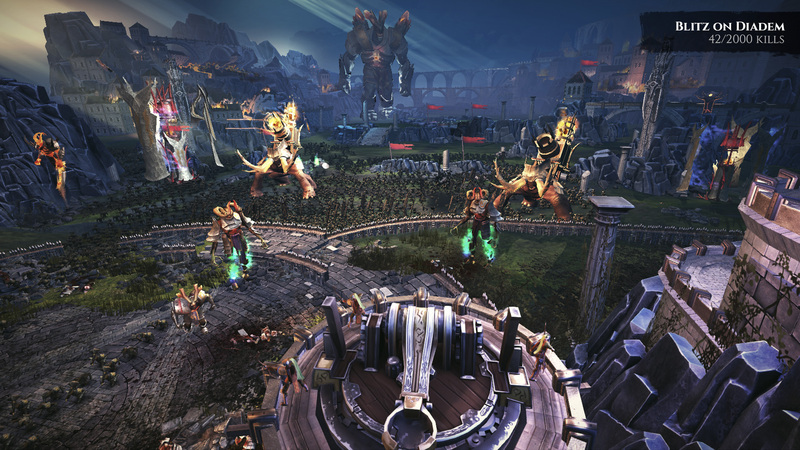 Enemies were designed to bee seen clearly in their approach and with their attacks patterns. 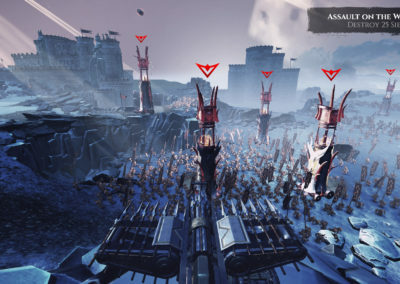 The health indicators were an exploration in detecting damage to the player, as well as the health of distant towers (descending flag concept) that you may be defending. These would be the first of many prototypes that would be built throughout the project. 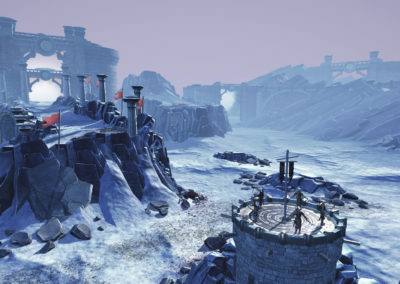 State Machines: The first prototype involved setting up some basic state machines and spawn patterns for instancing enemies and their attacks. HUD /Damage: I also wrote additional code for HUD and in-game damage indicators so we could tell which enemies were doing the most damage. Much of this prototype code would be reused and extended throughout the project. 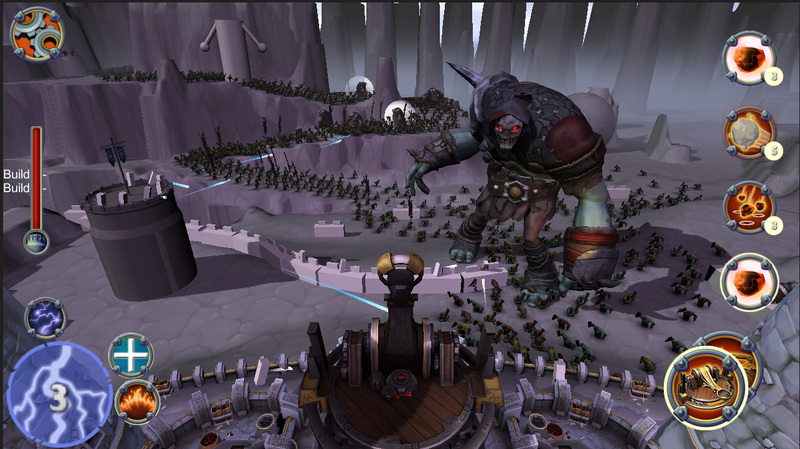 Testing an idea for a large, physical enemy creature that “vomits” other creatures onto the battlefield. 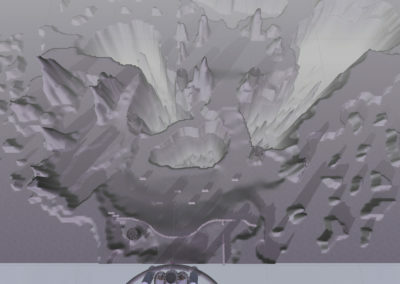 Its initial appearance was meant to provide a very memorable and intense moment while potentially giving some back story as to where these creatures were coming from. Initially, a Vomitous could be shot and forced to retreat. 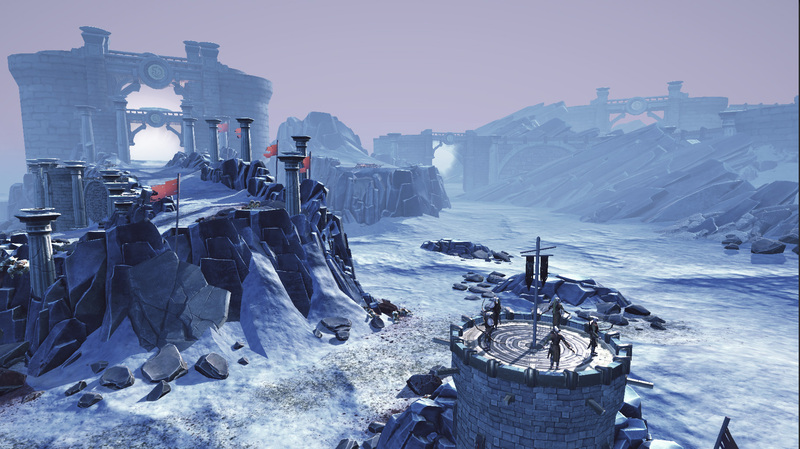 Once the player became stronger they could be taken down much sooner, enforcing the sense of player progress.